A bit late to the party, here is my very brief year in review for 2017. Firstly, after deciding on a name and direction for my business in 2016, I soft launched my new company – Made with Fuel – in early 2017 with a new website and branding. Apart from a few tweaks to the site to speed things up since then, I’ve been extremely happy with how it’s performed, both in terms of attracting better quality clients and how I feel it looks over a year later. I’m planning to add to it quite significantly in 2018 with new maintenance and support services coming in the next few months and more videos and blogs over the course of the year. I haven’t blogged that much overall but I now realise that when I do blog, I have something to say and I feel that the quality of my writing is better when this is the case. This year though, I hope to do more with video and to talk a bit more about how I work and what I do – something I’m finding easier the more I talk about it. Financially speaking, 2017 was a good first year for Made with Fuel as an incorporated company and whilst money isn’t everything, it’s important for business and I’m looking forward to working hard and growing the business again this year. 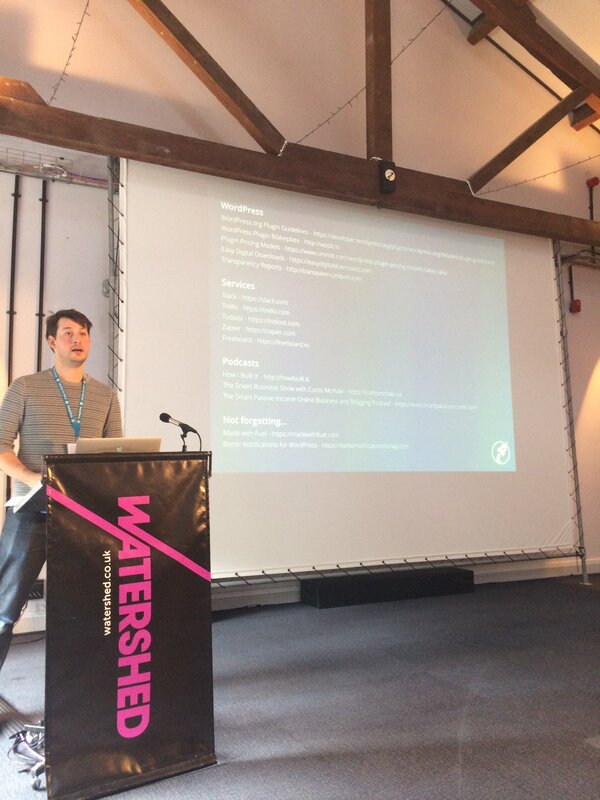 I was really lucky to be able to speak at WordCamp Bristol in May and to appear on two great WordPress podcasts throughout the year. Public speaking isn’t something I feel I’m necessarily good at but I wanted to push myself a bit and this was something I felt I could do. I throughly enjoyed speaking though and felt I came across well, both in person and in the podcasts, and would definitely do it again. I does take a lot of work to put together a good presentation though! My side-project (side-business? ), Better Notifications for WordPress, continued to grow steadily over the course of 2017. The first recurring payments starting to come through for the premium add-ons during the Summer and I released a lot of small but useful updates for almost all the add-ons and the free core plugin. I’m going to be looking at marketing this year and trying to capitalise on everything I’ve done / grown / built since I started the project. Personally, I had a good year. We replaced our boiler at home and this gave us the opportunity to reconfigure parts of the house which weren’t quite working for us, notably: the removal of rather ugly gas fire in the living room and a cramped en-suite in our bedroom. We’re currently looking at some minor electrical improvements before doing something else big (costly) towards the end of the year. We’ve just booked our first holiday as a family and I can’t wait for that having not been out of the country for the past 3-years. I made five short movies this year. I find this form of creativity something I really enjoy outside of my work as a designer and developer. I film everything with my iPhone and it’s wonderful to be able to look back on moments in the past year, particularly featuring my daughter, Lydia, as she grows and develops. I don’t have a particular theme and I don’t vlog – I just make a movie about whatever I feel like, whenever I feel like it and, much like blogging, I find this creates the best content. Release new maintenance and support services. Grow Better Notifications for WordPress and continue to develop it. Work on a few more eCommerce and Membership sites. Work on my house and make it feel more homely.